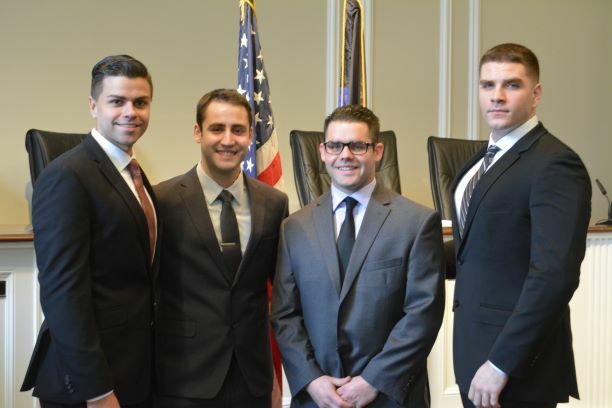 It was the first time in 20 years that as many as four new Rye Police officers were sworn in at City Hall January 4. They bring the force up to 36. All are Westchester residents and will attend the County Police Academy until the end of May. <<Joao Anjo>> earned his bachelor?s degree at CUNY City College, prior to joining RPD he was a certified court translator in both Spanish and Portuguese. <<Joshua Belloise,>> is a certified NYS Peace Officer who provided security at Empire State Casino in Yonkers. <<Jesse Calcagni>> holds a bachelor?s degree from Keene State College. He was a parking enforcement officer in the Village of Port Chester. <<Robert Jones>> earned his bachelor?s degree from Iona College. He worked in a family business before joining RPD.